Ha ha, hee hee…why am I laughing so much? 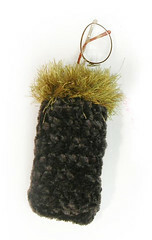 Fluffy yarn in a wrap for Spring! 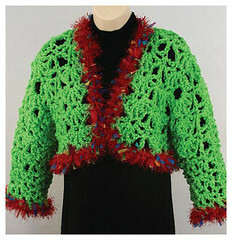 I can’t get over this one…ugly yet so funny too…lime green in fluff…crocheted into a wrap. Could it get any more hilarious than that? Looking fuzzy and hairy for Spring definitely must be an in and fashion forward look…can’t wait to see it on the streets! Oh, hey, it goes with the Lime Green purse! Tres chic! As an aside, what’s with the fake clouds and blue sky in the background? LOL! Ugh! To go with the hideous jacket & vest below? Yikes! Described as a “luxurious, beautiful purse made with so many luscious yarns like ribbon, mohair, eyelash, nylon, viscose and polyester…” Oh come on, that’s too many yarn types and not in any way combined well either. The colour is lime, green, baby pink, mustard and brown – just the right colour combo to look like spit-up! I do believe my eyes are bleeding…those colours don’t go together! 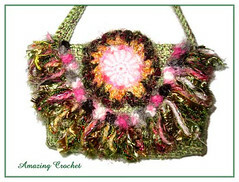 Add artistic crochet flair to any outfit – hey, I didn’t say it – the pattern did! Why is it that pattern makers think that people will buy their patterns when they use the ugliest coloured yarn possible to showcase it and trim it in some ghastly fun fur? Really, why? This is so ugly and the only place I can see it being worn is to a Hallowe’en costume party… Anywhere else, well, heads will turn. And the colour combo…oh my! Oh dear God, what the h*ll? 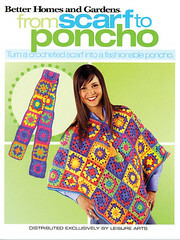 Take a really hideous scarf and turn it into a poncho? 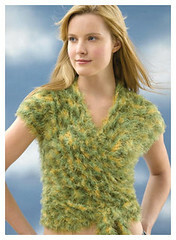 Is this supposed to make crocheters want to make bigger projects once they’ve mastered scarves? There are some really bad elements in this scarf/poncho… firstly, these have got to be the ugliest acrylic colours I’ve ever seen and secondly, granny squares just aren’t that attractive unless they’re on an afghan! Oh ya, such a wonderful combination! Where the h*ll did they find these colours anyways? Not one of them is anywhere near nice and then put them all together, well, yuck! 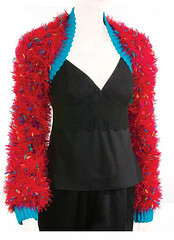 Hey, I found the perfect accessory for the “Gourmet Crochet Audrey” shrug posted below! Don’t you think these slippers are divine? And the flowers on them are superb. 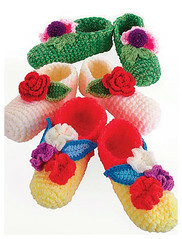 What a wonderful design this is… and meant to decorate your toes with posies! Wow, I never thought of that before…so glad someone else did. Made in an array of really tacky colours to suit any other fug piece you may have in your wardrobe too. I think I’ve found the perfect slipper! Anyone want to look like they had confetti thrown up on their arms? Here’s the perfect piece for you!! Meant to take the “chill” off your shoulders and arms. I’m not sure it’d be able to get rid of the chill you’d feel from the ugh of this piece. What a great way to stand out in a crowd that’s for sure…if, of course, you want people pointing and laughing at you! Thanks to Christy for this submission! Many of the things that get to you are not worth the energy and the trouble that you invest in them. Sometimes, the best response is no response at all. Seek to rise above the petty dramas that don’t do anyone any good. Keep in mind that where you put your awareness and your attention is where your life will go. A sign of true strength is the willingness to completely let go of the things that don’t really matter. WNTC’s future policy is to never include any of Josi’s designs on this site nor have them mentioned here – they aren’t worth our time. Tentacle fringe…oh so lovely! And looking like a squid…the look we’re all after I’m sure! The model is desperately trying to hide too…can’t blame her! 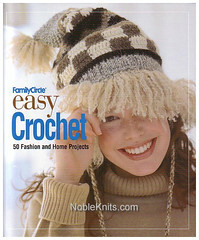 Tentacle fringe over one eye is so appealing too… Can you believe this hat made the cover of a magazine? Yikes! And what’s with the strings hanging off the sides? So wrong in so many ways. Thanks to one of our new readers, Maryann, for the submission!